It seems I’m not knitting just yet. BabyLiu and I hit the Barnes & Noble a couple of weekends back to pick up a copy of Knitmare on Elm Street (which we got) and Knit Your Own Zombie (which we didn’t – seems it won’t be released until December which I can’t help but notice is AFTER Halloween). I read reviews on both of these books in my October issue of Simply Knitting (they also reviewed Super Scary Mochimochi, which comes out next week, squee!) My deep love of all things Halloween meant I needed to get them fast quick now. Interesting note, Knitmare is called Evil Knits in England. Or at least the review copy of the book was. Creepy Cross-Stitch. Which I bought, despite never having done any cross stitching. Ever. I may be a smidge obsessed with Halloween. My black cat looks better in this slightly blurry photo than I think it does in real life. I think I’ll stitch up a few more. I have enough aida to make five more. I just have one question about cross stitch. What do I do with them when I’m done? 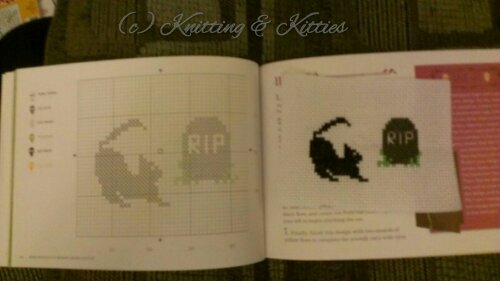 This entry was posted in FO, Holidays, non-yarn craft. Bookmark the permalink. Pop it into a frame and use for halloween decor. I’d say that you could sew them into little mini pillows and hang them from things as halloween ornaments, but I know how you feel about sewing. Frames is a good idea. I’ll try that. Thanks!